It is said that your first born will always carry a special place in your heart. As our first beer ever, Mangofeber has conquered tastebuds male and female, old and young, national and foreign. While we admit to always evolving this beer, so here is a light session version for anyone that wants to enjoy all the flavors with less buzz. Fruits off to you, mates! UPDATED: APR 20, 2019 Zapach średnio intensywny, owoce tropikalne, mango, brzoskwinie, trawa. Kolor żółty, mętne. Piana obfita, drobna, szybko znika, lekki lacing. W smaku wytrawne, niska pełnia, mango, cytrusy, trawa. Goryczka średnia, wysycenie wysokie. UPDATED: FEB 16, 2019 330ml bottle at a private tasting at za razBIRAchi. Pours hazy, clear from the top of the bottle but with sludge and particulate from the bottom, a minimal rocky head, not a lot of lacing and no visible rising carbonation. Dirty pale yellow in colour. On the nose, massively citrusy with grapefruit, lemongrass and mango. Frothy at first in the mouth, some fruity sourness, flavours similar to the aromas, thin texture - probably from the sourness, scarcely a touch of sugar, no malt presence before a crisp clean finish. Overall, a very standard, intensely hoppy Session IPA. UPDATED: DEC 7, 2018 33cl bottle. A murky light golden beer with a fast deminishing white head. Aroma of soft tart mango juice, lime, tropical fruits, fresh bitter hops. Taste of intense fresh hoppy tropical fruits, mango juice, mealy fruits, yeat and wheat, moderate bitterness. Quite nice! UPDATED: DEC 2, 2018 Keg at the Star and Garter, Bromley. Cloudy orange pour with a white head. Lots of mango in the nose, backed up with a spot of tangerine, pineapple, peach yoghurt. Flavours of mango, peach, pineapple. Very quaffable. Tap. Cloudy orange yellow color. Small size, white head, stays. So this is basically watered down and then dry hopped Fanta. Quencher. Tap at taptap. Hazy pale orange colour, foamy pale yellow sticky head, doesn't last, but leaves huge lacing. Aroma is very fruity, sweet, ripe yellow fruits, mango, apricoty. Taste is on bitter side fruity, grassy hops. Mango puree and hints of more exotic fruits in late aftertaste, but only hints. High carbonation, light body. Fizzy carbo makes it feel very light, even (sparkling) watery, but for 3.5 ABV it's still balanced and very refreshing. UPDATED: AUG 21, 2018 Flaska från ICA Örebro. Ljust disigt gul med vitt skum. 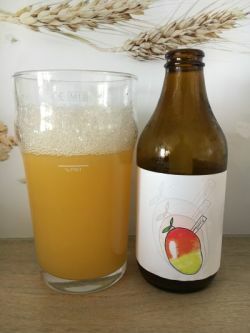 Fruktig och kryddig doft och smak med tydlig mango.